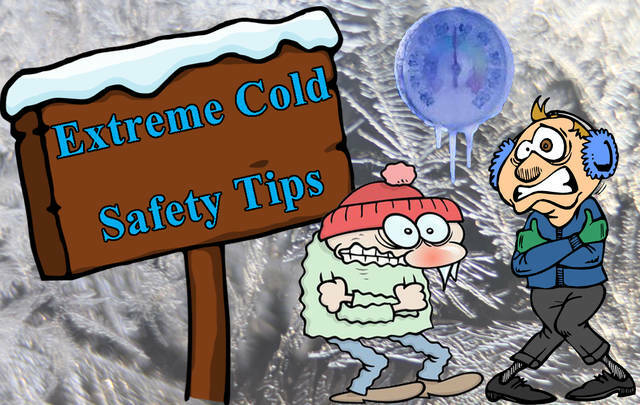 COLUMBUS — With sustained, bitter cold temperatures and dangerous wind chills predicted this week, the Ohio Department of Aging is reminds all to treat extreme temperatures just as you would a coming snow or ice storm. Be prepared. And check on older or ailing loved ones and neighbors before, during and after the mercury drops. Our bodies change as we age, prescription medications and more can make older adults more susceptible to the ravages of bitter cold temperatures. In addition, prolonged cold conditions like those expected this week raise the risk of freezing home plumbing, community water main breaks, automobile failures, transportation interruptions, power outages, home heating system failures and more. Assemble an emergency kit that includes a battery-operated radio, a flashlight and extra batteries, extra blankets and warm clothing, food that you can open and prepare easily and plenty of clean drinking water (at least one gallon per person per day), in case water supply lines are compromised. Open cabinet doors under sinks on exterior walls of your home and turn faucets to a slow drip to help prevent pipes from freezing. Place rolled-up towels or blankets around drafty windows and doors to help keep the cold air outside and the warm air inside. Know where the main valves and switches are for gas, water and electricity and ensure you or someone you trust can operate them should you need to shut them off. If you must use portable space heaters to warm your home, check that yours has been tested and certified to the latest safety standards. Keep heat sources at least three feet from combustible items, like papers, blankets and curtains. Never leave a fireplace or portable heater unattended; turn off heaters and extinguish flames when you leave the room or go to bed. Never use appliances that weren’t designed to heat your home, such as cooking stoves and ovens, for that purpose. Have a plan for a safe, warm place to go, and a way to get there, if it becomes unsafe to stay in your home. Is the temperature in their home comfortable? Do they have safe means to keep it that way if outdoor temperatures remain frigid? Do they need medical attention? Do they appear alert and aware? Have they fallen? Are they staying warm enough? Are they taking their medications as prescribed? If you or an older loved one become ill or injured during the storm, or if it becomes unsafe to stay in your home for any reason, call 911 for emergency assistance. Check local media or call local law enforcement to learn about the availability of warming centers or emergency shelters. Your area agency on aging can help identify emergency resources and services in your community. Visit the Ohio Department of Aging’s website (https://aging.ohio.gov) for contacts or call 1-866-243-5678 to be connected to the agency serving your community. About ODA – The Ohio Department of Aging serves and advocates for the needs of Ohioans age 60 and older, as well as their families, caregivers and communities. Programs include home and community based long-term supports and services, as well as initiatives to promote health and wellness throughout the lifespan.